When you need a tool and one doesn’t exist, sometimes you have to invent it yourself. That is often the case with Team ADEV as they develop suites of web applications to assist the Air Mobility Command with dynamic mission re-planning. When certain development tasks require too much manual effort, are too repetitive, or simply appear harder to do than they should be, developers look for a way to apply their programming skills to make the process faster and easier. Team ADEV works to foster a culture of innovation by encouraging team members to think outside the box in how they approach their work. This includes the Tesla Innovation Awards. Named after Nikola Tesla, whose pioneering breakthroughs continue to influence modern technology, recipients of this award have employed innovation and technology to solve problems and improve efficiency goals. Recently, four ADEV team members received Tesla Awards, the most ever awarded at one time. Nick Simmons, Senior Developer, and Nick DeTore, Software Tester, for the Regression Test Management Tool. Ken Hagerty, Software Developer, for the Protractor Results Analysis Tool. Brian Haggerty, Software Tester/Developer, for the AT Anti-Duplicationator 3000. The awards were presented at ADEV’s monthly town hall meeting at the end of May by Ken Rennie, DMR Deputy Program Manager, and Dan Shaffer, SE&D Director of Operations. These innovations were presented to the most of the ADEV team at the close of a recent Innovation and Planning Sprint. Prior to Nick Simmons and Nick DeTore’s innovation, Regression Tests (RT) within VersionOne could only be added to RT Suites one at a time. With the Regression Test Management Tool, users can now easily filter RTs by selecting tags and adding them to a new or existing Suite. This allows users to manage the RTs more efficiently so they can move onto more important tasks. Ken’s Protractor Results Analysis Tool is designed to help users separate the “valid” failures from the invalid in the Protractor tool. Without it, Protractor only displays the most unique failures as results and makes it difficult to aggregate failures by topic. With the Analysis tool, developers and testers can now identify the right failures so they can isolate and solve key problems. Duplicate testing occurs when a single VersionOne RT exists in multiple RT Suites, which causes the same acceptance test to be run multiple times. To combat this, Brian’s AT Anti-Duplicationator identifies all duplicates of a selected RT so testers can avoid them and move on with the testing process. This not only reduces the length of the Regression Test process itself but also eliminates the time spent locating the duplicates manually. 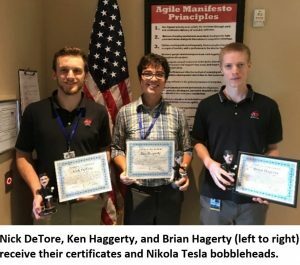 Along with a framed certificate of the award, each recipient received a Nikola Tesla bobblehead and a $50 visa gift card. Congratulations to Nick, Nick, Ken, and Brian for their hard work. 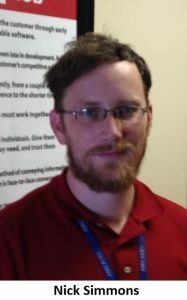 Nathan Reames is a Junior Technical Writer with the ADEV program.